Chipilo de Yuca. 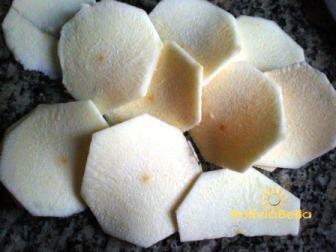 Manioc Chips. Bolivian Food Recipes. Bolivian Snacks. 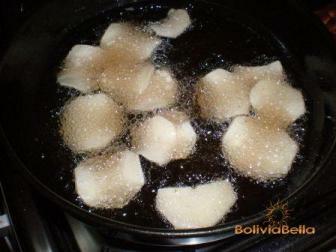 Chipilo de yuca are what we call fried yucca (manioc) chips in Bolivia. We also call fried plantain chips chipilos but we do NOT call potato chips chipilos. Potato chips (and french fries) are BOTH called "papas fritas". Yucca has been a staple in the Andean diet for thousands of years. It's hearty and filling and accompanies many different dishes throughout the country. However, the most common way to eat yucca is boiled or fried. Yucca is a root and is usually quite large (about the same circumference, but about 3-5 times the length of an Idaho potato). Yucca is a starch so usually when we accompany a meal with yucca we don't add potatoes, pasta or rice to the meal. This recipe is surprisingly simple. You just peel, cut, fry and serve the yucca. Yucca comes with a tough outer bark which you must slice off with a knife. Once the bark has been sliced off, wash off the yucca and place it horizontally on a non-slip cutting board. Cut very thin round slices down the entire length of the yucca (as shown in the photo above). Heat a pan of oil, about 1 inch deep until very hot. Place the yucca slices into the oil and fry for about 6-8 minutes until edges are golden. It's not necessary to fry the chips until they are golden or brown. It takes a long time to brown yucca and they would burn before you finished. 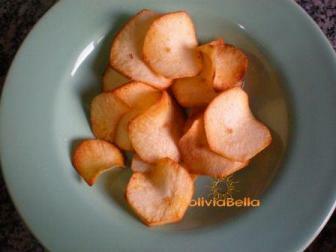 Yucca chips typically have a golden outer rim and remain white on the surfaces. When they form a toasty-colored outer ring, they're ready. Simply remove them from the oil and place them on a paper towel to drain the excess oil. Sprinkle salt over them before the oil dries so the salt will stick to them. Once dry, the salt will simply slide off. Wait until they are cool and serve. Yucca chips are very tasty! Did you know that TAPIOCA is made from yucca? So is root beer - it's the root that root beer is made of. Yucca is used in a lot of other products like medicinal products, oils, and cosmetics and haircare products. Notice to kids: Please do NOT make this recipe without adult supervision. It requires a great deal of extremely hot oil and is very very dangerous!! !